– Meg Whitman, HP CEO in response to the question of whether Apple could overtake HP in computer sales in 2012.
via HP CEO Meg Whitman Admits Apple Could Surpass HP in 2012 | MacTrast. However, according to Gartner, HP shipped 14.7 million PCs in the last quarter. While we don’t have the total global figure for Apple, my estimates are 5.2 million Macs and 14.7 million iPads, for a total of 19.9 million computers in the same period. There might be an error in both Gartner’s and my numbers, but the gap of over five million in Apple’s favor is unlikely to disappear. The history of shipments from these vendors is shown below. I included the market shares thee years ago, and the rankings with the iPad excluded. 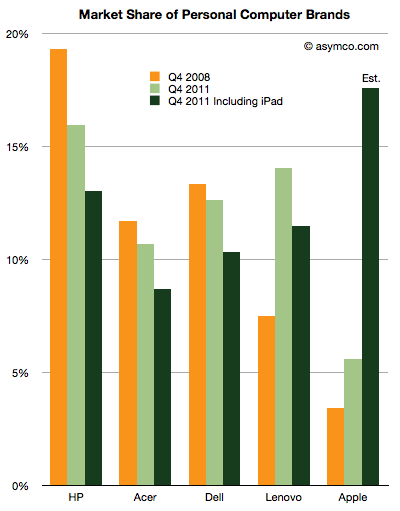 Apple went from 3.42% share at the end of 2008 to 5.6% share today excluding the iPad or 17.6% including the iPad. HP went from 19.3% in 2008 to 16% today or 13% if iPad is included. 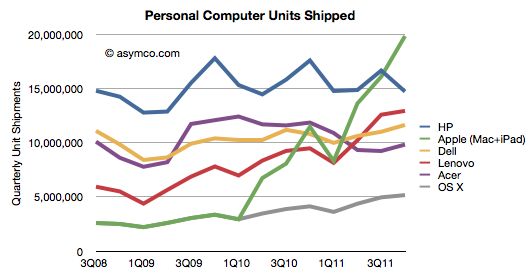 Apple is ahead of schedule on their taking the top spot in terms of units. Although vendors other than Apple also sell tablets, their totals are unpublished and I am not aware of any estimates so. If anyone has seen estimates I would be happy to amend the data. Throughout the history of the industry, Apple never held the top spot. The Apple II peaked at 15.8% in 1984 and the Mac at 12% in 1992. ‹ Previous Post Is the iPad a PC?